Eyeballs, a severed hand or fingers carried in ziplock bags. Back alley eye replacement surgery. These are scenarios used in recent blockbuster movies like Steven Spielberg’s "Minority Report" and "Tomorrow Never Dies" to illustrate how unsavory characters in high-tech worlds beat sophisticated security and identification systems. 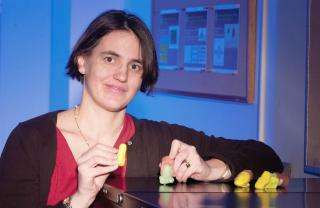 Photo: Clarkson University Associate Professor of Electrical and Computer Engineering Stephanie C. Schuckers, with imitation fingers. Simple casts made from a mold and material such as Play-doh, clay or gelatin can be used to fool most fingerprint recognition devices. Schuckers, an expert in biometrics, the science of using biological properties, such as fingerprints or voice recognition, to identify individuals, is a partner in a $3.1 million interdisciplinary biometrics research project funded by the NSF with support from the Department of Homeland Security. Sounds fantastic? Maybe not. Biometrics is the science of using biological properties, such as fingerprints, an iris scan, or voice recognition, to identify individuals. And in a world of growing terrorism concerns and increasing security measures, the field of biometrics is rapidly expanding. Schuckers’ biometric research is funded by the National Science Foundation (NSF), the Office of Homeland Security and the Department of Defense. She is currently assessing spoofing vulnerability in fingerprint scanners and designing methods to correct for these as part of a $3.1 million interdisciplinary research project funded through the NSF. The project, “ITR: Biometrics: Performance, Security and Societal Impact, ” investigates the technical, legal and privacy issues raised from broader applications of biometric system technology in airport security, computer access, or immigration. It is a joint initiative among researchers from Clarkson, West Virginia University, Michigan State University, St. Lawrence University, and the University of Pittsburgh. Fingerprint scanning devices often use basic technology, such as an optical camera that take pictures of fingerprints which are then “read” by a computer. In order to assess how vulnerable the scanners are to spoofing, Schuckers and her research team made casts from live fingers using dental materials and used Play-Doh to create molds. They also assembled a collection of cadaver fingers.